-Move alarm clock on table and pick up black fleur-de-li-like object underneath. -Pick up wall clock to the right of wall picture. -Pick up candle on table by fruit bowl. -Tap on fruit bowl to tip bowl then pick up fleur-de-li-like object. -Take 2 fleur-de-li pieces from inventory and place together to make whole fleur-de-li. -Pick up black object (anvil) by lamp on table. -Pick up key from bottom right cupboard to table stand. -Find wardrobe cabinet to the left of window and zoom in at bottom drawer and pick up loop-shaped object. -Use key from inventory to open two-door cabinet on left side of the room and pick up silver object (sword-holder) and brown box from shelf inside. -Use fleur-de-li symbol from inventory as key to open brown box and pick up half-sun object inside. -Tap on left screen arrow to go to next room. -Find lamp by flower vase and pick up lamp switch in shape of letter T.
-From inventory place loop-shaped object and letter T object together to form Ankh symbol. -Pick up blade from red mounted wall crest with fleur-de-li symbol. -From inventory assemble blade and sword holder together to make sword. -Pick up matchbox on shelf cupboard near candle on skull. -Pick up biohazard box from shelf cupboard top right corner shelf by zombie. -Pick up gravel on top of shelf. -Tap on left screen arrow to room with cloaked old lady. -Pick up book on table near flower vase. 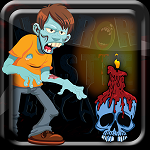 -Tap on flower vase and pick up piece of biohazard symbol. -Tap on book from inventory and pick up piece of memo paper from inside book. -Use the following from inventory: use matchbox from to light candle then place paper piece over flame to get clue number 196. -Tap on drawer below mirror and pick up brown box from inside drawer. -Pick up stick object from step stool. -Find eyeball decor by window and pick up piece of biohazard symbol from corner of eyeball décor. -Do the following from inventory: Place stick flat onto anvil and use gravel to hit on stick then place stick back into inventory. -Use stick from inventory and open back of triangle wall clock from inventory and pick up key and clue shape in letter O. -Tap on drawer below mirror and use key from inventory to open drawer and pick up yellow key-like symbol inside. -Tap on right screen arrow to go to living room. -Go to table drawer with alarm clock and insert clue number 196 in middle drawer and pick up brown box. -Use Ankh symbol from inventory to open matching box and pick up ruby and piece of biohazard symbol. -Place all biohazard pieces and letter O from inventory together to form symbol. -Use biohazard symbol from inventory to match brown box symbol and pick up grey circle and yellow piece of symbol from inside box. -From inventory assemble two pieces of yellow symbols together with sword from inventory so the symbol is similar to a cross between key and sword. -Use key-sword cross symbol from inventory and match with brown box from inventory and pick up half-sun object from inside. -Assemble the following together from inventory: half-suns, then grey circle on top, then red ruby on top of sun symbol. -Tap on right screen arrow to go to door. -Insert sun symbol into brick imprint to the right of the door and pick up key. -Use key to open door.